Kerala Health Minister V. S. Sivakumar has announced that surveillance cameras would be installed in Ward 9 of the General Hospital in Trivandrum. Ward 9 is where the hospital authorities admit older persons who require geriatric and palliative care. The ward is over crowed with double the number of patients against bed strength. There was complaint that the body of a patient who died was left in the ward for hours without moving it out to the mortuary. The Minister visited the ward in view of the the complaint and reports of pathetic conditions at the ward. His prescription of cameras (in addition to promise of more staff) would deprive the old men of their private moments. Many lie there half-naked often without any relative to care for them. The ward sometimes see emotional outbursts as well as intimate moments with family members. It is not clear why the Minister wants cameras in the ward. Is it for the hospital superintendent or other to keep watch on what is going on in the ward? Is it to check whether bodies are lying on the floor? Is it assist the nurses in keeping tab on the patients owing to shortage of staff? Or is it to see whether the patients are being care for or is it to keep prying media men out of the precincts? Whatever it is, surveillance cameras in hospital wards is not a good idea. It is not even good for classrooms. Some tuition masters and schools in the city have installed cameras in their classrooms to keep tab on the students. What kind of attitudes would children develop when they are aware that they are being constantly watched upon? Classrooms are not private places. Still, they have a right to some kind of privacy, at least during intervals. 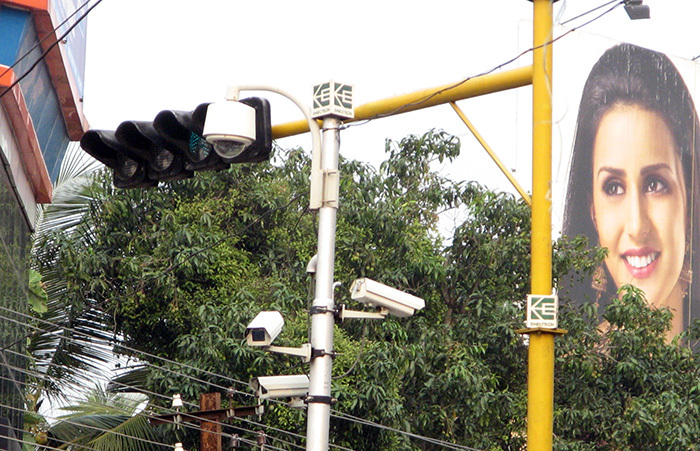 Traffic police and Motor Vehicles Department are also increasingly using cameras for surveillance.There are more than 500 cameras installed in Trivandrum city while Kochi have about half the number. Cameras from private establishments are also being connected to the police control rooms. You will be watched as you pray at the Sri Padmanabha Swamy temple in Trivandrum (though not at the sanctum sanctorum). 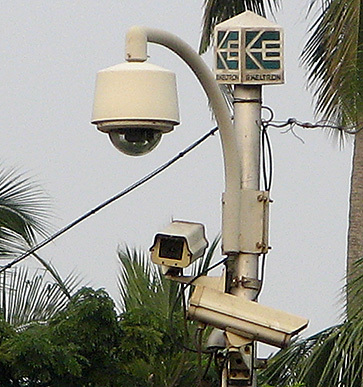 Some residence associations are also setting up cameras to find people dumping waste in this locality though the legality of installing such surveillance by private persons in public places is in doubt. Vehicles as well as citizens are under constant watch along the main thoroughfares of the city. Though the cameras help to book traffic offences by capturing screenshots of violations, police men are still on the streets directly booking offenders. So, harassment of drivers and corruption do not disappear. Anyway, the police still need personnel at junctions to regulate traffic and it doubtful whether monitoring of the video feeds are constant. If effective monitoring of all junctions and other points are to be done, one requires a large number of personnel at the control rooms. This cannot be cost effective despite the advantages of the technology and falling costs of equipment. (The 57 cameras at Padmanabha Swamy temple reportedly cost about Rs. 15 millions). Besides, misuse of the system by police as well as private citizens could not be ruled out. When police criminal nexus exists, surveillance could even aid criminals and quotation gangs. It is any way a case of big boss watching over the citizens from all angles. Police can use the system to track movements of politicians, journalists and others. Though it is said that camera surveillance would help to check crimes, it effectiveness is yet to be proved (except in the case of traffic offences). The advantage could be limited as cameras would only force shifting of occurrence of crimes from city centres to the suburbs. Somewhere we have to strike a balance between privacy, surveillance and prevention of crimes. Kashmir’s highways are one of the most precarious in the country. You travel through precipitous ridges: a small slip, your vehicles could fall into deep gorges. 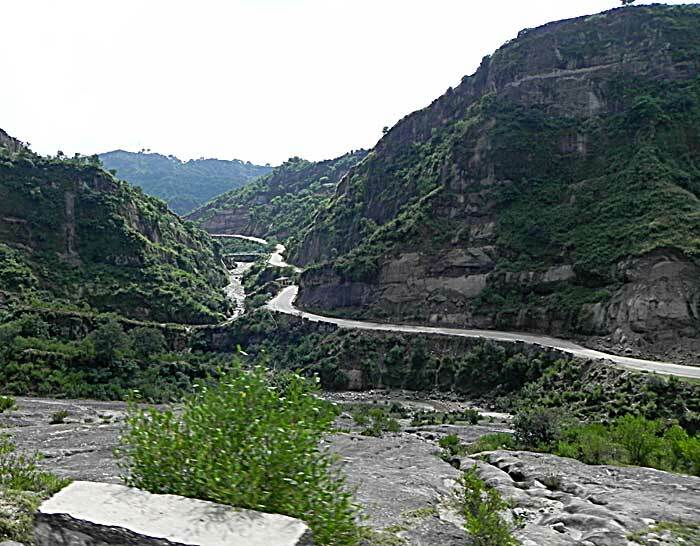 The width and condition of the highway from Jammu to Srinagar are so poor that you often have to move through the outer edges of the highway which may not be stable. Though highways are being widened and developed from Jammu to Punjab, much of the highway from Jammu to Sri Nagar remain in bad shape despite heavy traffic. 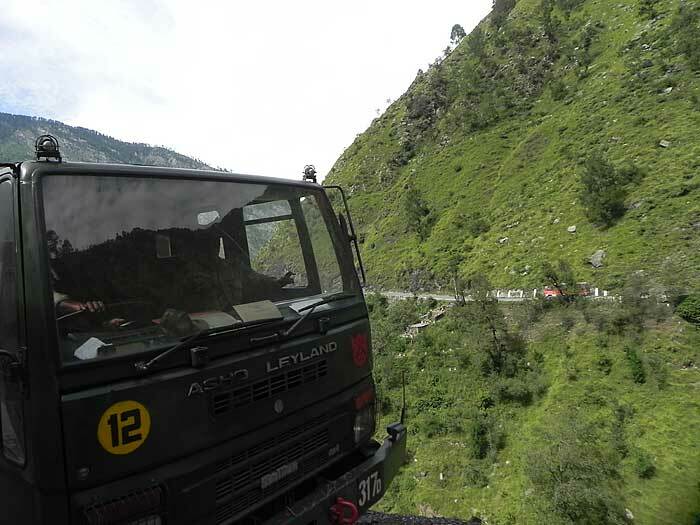 The Border Roads Organisation is in charge of the development of the highway. However, it has so far failed to develop safe roads, which is challenging task. The highway passes through mountain slopes and slopes below and above are prone to landslips at many places. There are also areas where boulders would roll down on to the road. The situation poses a major technological challenge which is yet to be addressed. Road accidents continue to be on the high side in the State. During three years from 2009 to 2011, as many as 3,288 persons were killed and 27,165 injured in 18,786 accidents in the State. The number of accidents was on the increase during these years. With militancy on the wane, it is said that the more persons are now getting killed in road accidents than in terrorist attacks and army operations. The Centre recently sanctioned Rs. 1248 crore to Jammu and Kashmir for improving connectivity to its villages. The State government has plans to develop the historical Mughal road for ecotourism purposes. These are ecologically sensitive areas with rich flora and fauna and water bodies. The road development has to keep in view the conservation of wildlife habitats and ecosystems.